Joe Leigh Simpson, M.D. received his medical education and training at Duke University (M.D., 1968). He subsequently trained in Obstetrics and Gynecology and in Pediatrics at Cornell University Medical College (New York City), and took laboratory training in cytogenetics. Previous positions were at Northwestern University (1975-86), and as Chair at University of Tennessee Memphis (1986-94), and then Baylor College of Medicine (1994-2007). He is certified in medical genetics as well as in obstetrics and gynecology. Dr. Simpson has played leadership roles in many professional organizations. He was 1993-1994 President of the American Society for Reproductive Medicine, 1994-1998 President of the International Society of Prenatal Diagnosis, and 1998-1999 President of the Society for Gynecologic Investigation. 2007-2009 President of the American College of Medical Genetics and 2006-2009 President of the Preimplantation Genetic Diagnosis International Society. 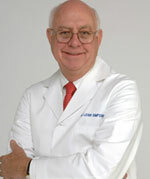 He is President Elect of the International Federation of Fertility Societies (IFFS) (2010-2013). He is a member of the Institute of Medicine (IOM) of the National Academies of Sciences. Dr. Simpson has written 15 major books and over 700 articles and chapters. He is active in many areas of prenatal genetic diagnosis, cytogenetics and reproductive genetics. Current research includes genetics of ovarian failure, which has resulted in finding several causative mutations (FIGLA, NOBOX) in continuing collaborative work with colleagues at Shandong University, Jinan, China. Work in prenatal genetic diagnosis focuses on preimplantation genetic diagnosis, and recovery of intact fetal cells from maternal blood for noninvasive prenatal genetic diagnosis. At FIU Dr. Simpson and colleagues in the College of Engineering (Drs. Anthony McGoron, Wonbong Choi and Chenzhong Li) are seeking to develop nanoscale devices to detect exposure to toxins unspecified with respect to nature and magnitude, thus providing application in both civilian (superfund contaminated sites) and military theatres. Simpson, J.L. : Disorders of the gonads, genital tract, and genitalia. (In) Principles and Practice of Medical Genetics., 6th Edition (D.L. Rimoin, J.M. Connor, R.E. Pyertiz, B.R. Korf eds.). Churchill-Livingstone, New York, In press 2011. Simpson, J.L. Genetic and phenotypic heterogeneity in ovarian failure: overview of selected candidate genes. Ann NY Acad Sci. 1135:146-154, 2008. Zhao H., Chen Z.J., Qin Y., Shi Y., Wang S., Choi Y, Simpson J.L., Rajkovic, A. Transcription Factor FIGLA is Mutated in Patients with Premature Ovarian Failure. Am J Hum Genet. 82(6)1342-1348, 2008. Jorgez, C.J., Dang, D.D., Wapner R., Farina, A., Simpson, J.L., Bischoff, F.Z. Elevated levels of total (maternal and fetal) beta-globin DNA in maternal blood from first trimester pregnancies with trisomy 21. Hum Reprod. 22(8):2267-2272, 2007. Kamat, A.A., Sood, A.K., Dang, D., Gershenson, D.M., Simpson, J.L., Bischoff, F.Z. Quantification of total plama cell-free DNA in ovarian cancer using real-time PCR. Ann NY Acad Sci 1075:230-234, 2006. Jorgez, C.J., Simpson, J.L., Bischoff, F.Z. Recovery and amplification of placental RNA from dried maternal blood spots: utility for non-invasive prenatal diagnosis. Reprod Biomed Online, 13(4):558-561, 2006. Gylfason, J.T., Dang, D., Petursdottir, V., Benediktsdottir, K.R., Geirsson, R.T., Poindexter, A., Mitchell-Leef, D., Buster, J.E., Carson, S.A., Simpson, J.L., Bischoff, F.Z. : Quantitative DNA perturbations of p53 in endomentriosis: analysis of American and Icelandic cases. Fertil Steril 84(5):1388-1394, 2005.